Typhoon ‘Lando’ brought power down in 12 provinces located in North and South Luzon, the country’s grid-operator National Grid Corporation of the Philippines (NGCP) said. On Sunday, NGCP reported the provinces that had power interruptions due to typhoon “Lando” are: La Union, Pangasinan, Aurora, Cagayan, Isabela, Nueva Ecija, Zambales, Tarlac, Quezon and Batangas. For La Union, the areas without electricity are Naguilian, Burgos, Bagulin and parts of Bauang and San Fernando City. Pangasinan towns hit by the power disruption which covers part of Urdaneta City, part of Asingan, Villasis, Rosales, Balungao, Sto. Tomas, Sta. Maria, Tayug, San Nicolas, Natividad, Umingan, San Quintin, Alcaia, Bautista, Bayambang, Basista, part of Malasiqui, Bugallon, Lingayen, Binmaley, San Carlos City, Malasigui, Urbiztondo, Mangatarem, Aguilar, part of Batista (Pangasinan), Labrador, Sual, part of Lingayen, Alaminos and Mabini. The Cagayan municipalities of Magapit, Sta. Teresita, Gonzaga and Sta. Ana are without electric service. Power service was also cut-off in the towns of Reina Mercedes, Benito Soliven, Naguilian, San Mariano, Ilagan, Gamu, parts of Cauayan and Burgos. 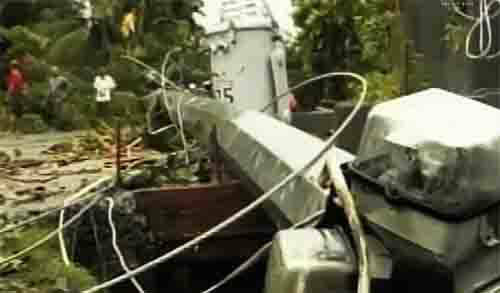 The damage to power lines was also severe In Nueva Ecija towns of Gen. Tinio, Penaranda, San Leonardo, Sta. Rosa, Fort Magsaysay, Natividad, Llanera, Palayan, Bongabon, Gabaldon, Laur, Rizal, Talavera, San Isidro, San Roque, Sapang Jaen and Gapan. In Aurora province, the typhoon severed power supply in Dingalan, Dipaculao, Ma. Aurora, San Luis and Baler. In Zambales, the power outaged areas Consort Land Inc., Subic, and Castillejos. For Tarlac, the affected areas are: Paniqui, Camiling, San Jose, Gerona, Sta. Ignacia, Moncada and Victoria. In Quezon blackouts came to Real, Infanta, Gen. Nakar, Famy, Pakil, Hondagua, Calauag, Alabat island, Tagkawayan. Also experiencing power outage were the towns of Del Gallego in Camarines Sur and Sta. Elena in Camarines Norte. In Batangas some business establishments were also affected. This entry was posted in LUZON, NEWS, WEATHER STORIES and tagged electric cooperative, National Grid Corporation of the Philippines, typhoon. Bookmark the permalink. US drone was used in PNP-SAF Mamasapano assault?